The Guest Suite consists of a large bedroom and half bath. It had new carpet (I'm not a carpet fan) which we left in place. One major concern of mine going in to this project was the sheer cost of beds. We planned on six beds and every way we could arrange it, pricing it out was so expensive. Nothing is worse than bad mattresses in a vacation rental (ask me how I know) and we didn't want to skimp or buy gross used mattresses. Through craigslist, we came across a man from NYC who had purchased a furnished condo in Sarasota and wanted none of the upscale furnishings in it which is where the guest bedroom furniture came from. Sean later noticed a Paula Deen tag in the drawer and when I looked up the prices for the furniture online, one nightstand costs as much as we paid for two bedrooms. I did a little happy dance. It is great quality furniture. The nightstands in the guest room are $6 IKEA tables. Lamps were from my mother-in-law and I spray painted them aqua. Wall and shelf décor is Hobby Lobby clearance. The shelf came with the house. Bedding is a combination of TJ MAXX and things I sewed. (Yes, I brought my sewing machine to Florida!) Curtains (not shown) are plain IKEA panels that I hemmed and sewed ribbon on to. 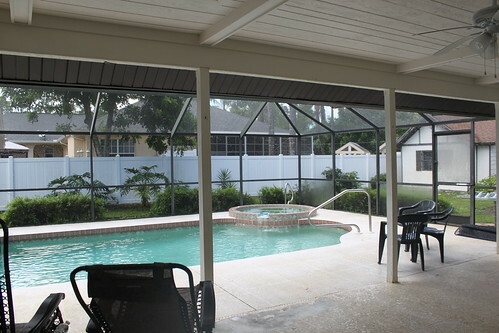 I also sewed fabric panels for the French doors to provide privacy. 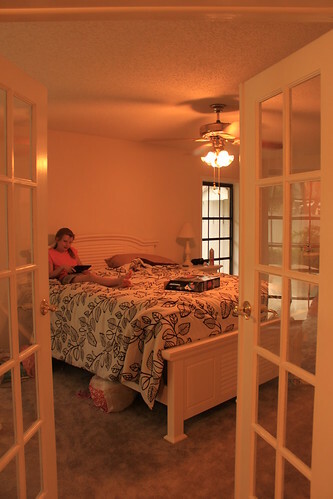 The Guest room has windows and sliding doors to the pool area. 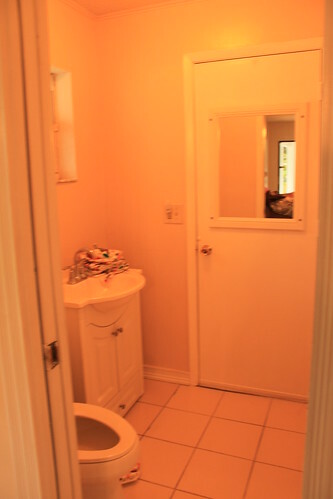 The bathroom, while convenient, was definitely added as an afterthought and was sparse and plain with an ugly window. 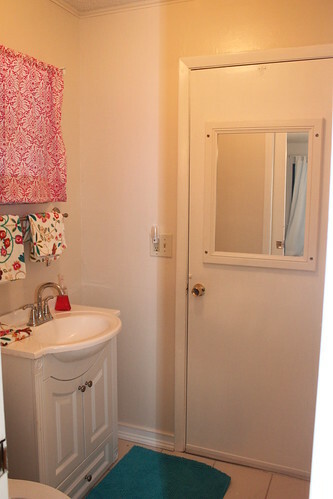 I added a curtain from Hobby Lobby fabric, colorful plush towels from Ross, a thick chenille rug from IKEA. I am loving the makeover tour!! 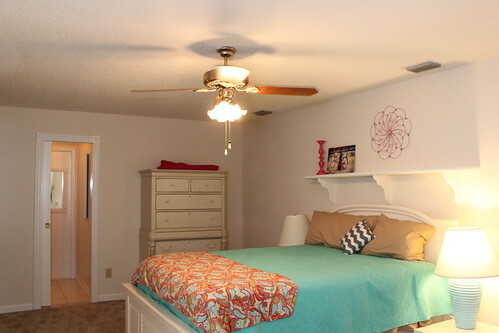 ANd I love everything in the guest room. One question--is this your family's vacation home? Or will you be renting it out? Wasn't clear on that. Either way it is lovely. ahhhh yes looks perfect ! !